In “The Queen’s Justice”, we get a taste of Cersei’s wrath and determination. It’s easy to remember how vindictive Cersei is. It’s a common trait she shares with Ellaria, who is paraded through King’s Landing alongside Yara as Euron claims a stunning victory and command of the Cersei’s navy. What a better gift than the woman who killed her daughter, and it’s fitting for Cersei to inflict the same treatment onto Ellaria: a poisoned kiss onto the lips of Ellaria’s daughter. As both mother and daughter are chained and gagged on opposite walls, Cersei is ruthless and unforgiving; Ellaria is to watch her daughter die and rot, forever bound to that cell. After a tumble with Jaime and not really giving a damn about who seems them together, a representative of the Iron Bank arrives to claim their debt. His presence reinforces what is at stake if Cersei were to lose the war, but she’s confident she’ll repay her debt in full within a fortnight. She’s cornered by enemies everywhere and not as strategically weak as we may think she is. There’s a lot of time for bloodshed. However, Cersei’s cruel act is not the only highlight of this episode. Jon Snow and Ser Davos arrive at Dragonstone and it’s a bit of a shock with dragons soaring too close for comfort and Dothraki men escorting them. Dragons haven’t been around for centuries and the Dothraki have never set foot on Westeros; now we see why Daenerys believes she is the rightful queen of the Seven Kingdoms when she has accomplished so much to get here. The moment Jon and Daenerys meet, it’s almost mythical. It’s been talked about for seasons and here it is. “I’ve brought ice and fire together,” Melisandre tells Varys. And damn right she did. But as can be expected, Jon and Daenerys clash: Jon won’t bend the knee and Daenerys doesn’t believe in the enemy beyond the Wall. Instead, Daenerys gives a solid pitch for pledging to her, affirming that it was meant for a Targaryen to sit on the Iron Throne and for a Stark to serve as Warden of the North. “Honor the pledge our ancestors made,” Daenerys states. Thing is, Jon sees the Night King has the priority and while he agrees with Daenerys, he’s adamant she’ll be ruling over a graveyard if they don’t stop the White Walkers. While we know how terrifying the Night King and his army is, one so powerful it can wipe out humanity, this all sounds bonkers to Daenerys. Ice and Fire together. Source. Atop the cliffs of Dragonstone, Tyrion finds Jon and says the truest statement of all: “You look a lot better brooding than I do.” But he has a lot to brood about, especially about the fact he thinks nobody believes him when it comes to the Night King. So Tyrion does something that is slightly more realistic: he convinces Daenerys to let Jon mine dragonglass. It’s a subtle victory and a step forward to a possible alliance. Back at Winterfell, Sansa is in the midst of preparing resources for winter when Littlefinger offers her some advice. But enough of that: Bran Stark returns home and it’s a pleasant reunion. However, Bran is the Three-Eyed Raven now, and as he tries to explain to Sansa that he sees everything, all things happening at once, he recalls the details of her wedding night. Sansa leaves, shaken from her first proper conversation with her brother. Bran’s presence at Winterfell cannot be a coincidence with the White Walkers making their move. He has a role to play. In the Citadel, Jorah Mormont is declared cured of greyscale, thanks to Sam. The two part in friendship. The Archmaester is impressed with Sam’s ability perform the procedure that even the most highly trained healing maesters can’t do. This earns him the task of making copies of rotting scrolls. Not exactly the best reward, but at least Jorah isn’t dead. As Jorah makes his way back to Daenerys, the siege to take Casterly Rock is underway. The destruction of Daenerys’ fleet by Euron Greyjoy set them back quite a bit, but that doesn’t stop them from moving forward. Tyrion’s knowledge of the sewer system (well, he built them) gives the Unsullied, led by Grey Worm, access into the impregnable fortress. The visuals of the battle are not lost on us, but the lack of Lannister soldiers is confusing even to Grey Worm. The Queen of Thorns herself. Source. As Grey Worm looks out at sea and sees their ships being burned, the scene cuts to a large army of Lannister men led by Jaime descending on Highgarden, clearly on a mission to pay back the Iron Back with Tyrell gold. Casterly Rock was a diversion, according to Jaime, pulling a similar trick on Daenerys as Robb Stark did to him. Inside, Lions and Golden Roses are bloodied or dead, but the Lannisters succeed, leading to a rather interesting conversation between Queen Olenna and Jaime. After deliberation on Cersei and her reign, Jaime hands her a poisoned wine glass. There will be no pain, Jaime promises. After she drinks, she recalls Joffrey’s death. “I want her to know it was me,” Olenna tells Jaime, revealing herself as his killer and having the satisfaction of Cersei knowing as well. 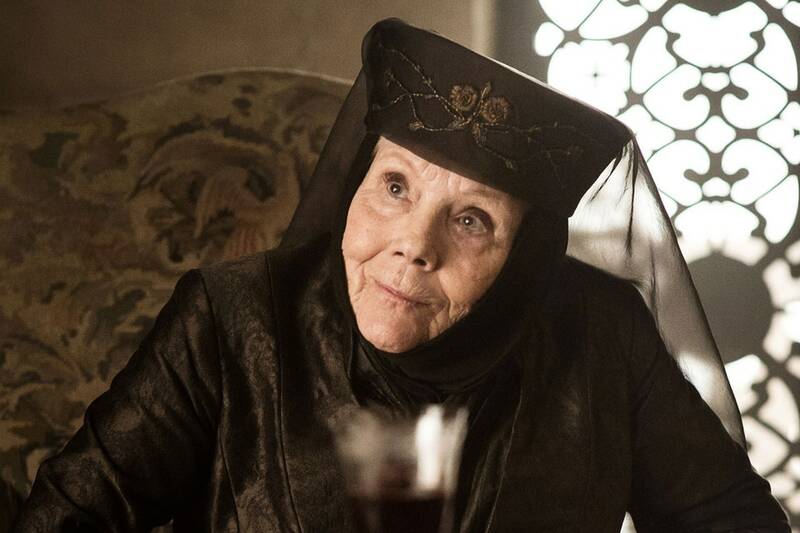 Wonderful last words, Olenna. In a way, she gave her own justice in the end. Absolutely zero chill.